Since 2008 Blockchain technology has been mainly used by financial sector, but now many companies foresee important digital transformation of their business thanks to it. But what is the real application of it ? This decentralized technology allows information to be stored and distributed securely and at a lower cost. Bitcoin as a cryptocurrency is the most well-known and popular example of blockchain technology use but a lot more experiences in other sectors are successful. 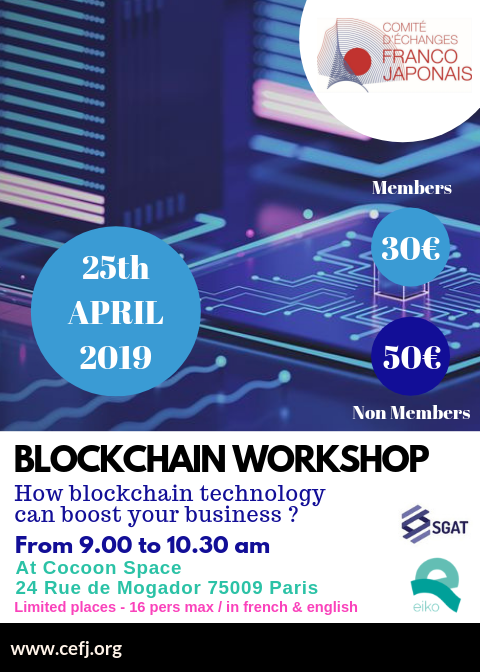 This workshop will help you to understand what is blockchain, how it is used in France and in Japan and how it can be a real advantage in your business strategy..
9.00 : Introduction by Mrs Noriko Carpentier Tominaga, General Delegate.